Stampin’ Around Wheels are an inexpensive and fast way to add texture and charm to any project. They are a great complement to many stamp sets and projects. Let me show you how you can create 11 different techniques using our Stampin' Around Wheel. 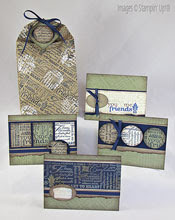 In this class you will make one gift bag with tag to hold four coordinating cards with envelopes. These beautiful vintage themed cards feature the Friendly Words Jumbo Stampin’ Around Wheel. 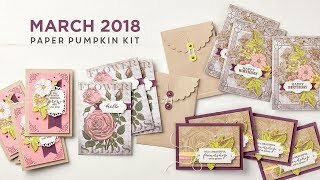 Enjoy learning some great wheel techniques while creating this set of beautiful heartfelt cards to share with friends and family. Friendly Words Jumbo Stampin’ Around Wheel, Stampin’ Around Jumbo Handle, Two Wheel ink cartridges, Stampin' Pastels, all paper and accessories, PDF project guide emailed to you (includes detailed step-by-step instructions, full color photos, tips and techniques). Order By January 29th and Class kits will ship out February 5th. 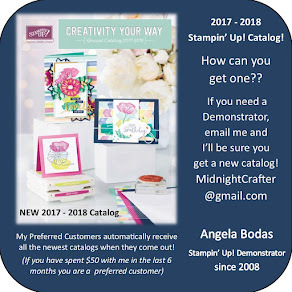 Email me to order at angelabodas@comcast.net : please include your name, mailing address, phone number, and payment option: personal check or Paypal (paypal invoice can be emailed). EMAIL ME by Friday January 29th to order your Class-to-Go. Once payment is receieved, supplied will be ordered and the Class-to-go should ship out to you on 02/05/10. The Project Guide will be emailed to you.